The region is home to some of the lowest pricing on the planet. But transmission constraints and currency risks remain a hindrance. Latin America will see 1.8 gigawatts of solar capacity added in 2016, bringing the total to 4 gigawatts in the wake of successful auctions in Argentina, Chile and Mexico that ushered in lowest-ever prices for solar. The region is expected to significantly increase its global share of annual PV demand, to 3.4 percent of the total market, according to the Latin America PV Playbook. That global share will significantly increase over the next two years as projects awarded in recent auctions begin generating electricity. Risks persist however, with uncertainty still surrounding the procurement of financing in Argentina, and currency depreciation in Mexico as a result of Donald Trump’s election win. The election results pushed Mexico's currency to an all-time low against the dollar for a brief period, while concern surrounds the Republican president-elect’s energy policies and future U.S.-Mexico trade relations. According to Manan Parikh, a solar analyst at GTM Research and author of the Playbook, the region is building upon previous years’ successes, and over the next two years the level of PV demand will increase dramatically. “The completion of Chile’s transmission line next year, connecting the north and south, will open the floodgates for projects, giving the country a long-term positive output, with 5-6 gigawatts of projects under construction,” he said. But while Chile still leads Latin America with a 39 percent share of regional capacity, the pipeline is slowing. Mexico is afforded the strongest outlook by the Playbook, given the success of auctions in March and September. The country is expected to harness its huge solar potential as global players awarded projects set up shop there. 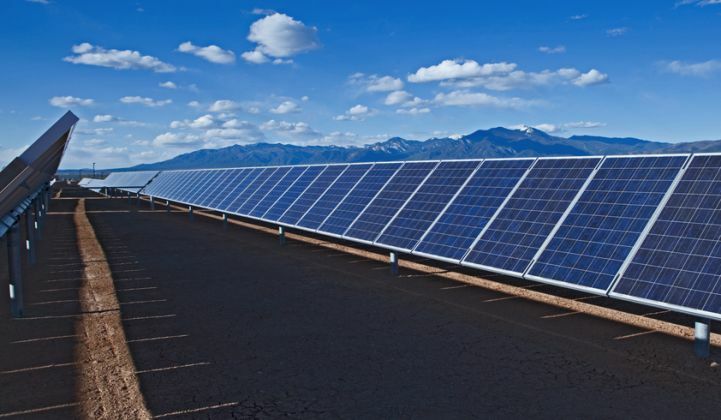 The country’s PV capacity will grow 275 percent this year, adding 390 megawatts. However, this remains below earlier expectations, given the time between auctions and project completion. Up to 4 gigawatts of solar projects are expected to be added to Mexico's grid by 2019. Growth is expected to surge in coming years as a result of the two auctions. Meanwhile, the cap on net metering projects was not lowered, providing a solid platform for larger distributed generation projects to flourish, the report states. Mexico’s auctions tendered 2.4 gigawatts of PV capacity, achieving record-low prices of $45 per megawatt-hour. Solar dominated the second auction, with 49 percent of the total capacity tendered. “Mexico has the lowest utility-scale solar prices in the region,” Parikh said. And the country has the greatest potential for distributed generation in the region, given its recent energy market transition, according to the Playbook. Prices so low could discourage some developers, however. But falling PV component costs increase the power source’s competitiveness. Locational variability in price has also helped to spread solar to more regions in Mexico. Prices at the northern border are as low as $23 per megawatt-hour, but more remote regions, such as the southern portion of Baja California and the Yucatán peninsula, are seeing prices almost six times higher. Mexico’s energy ministry announced this month that multiple buyers will be allowed in the third auction, in addition to state-owned utility CFE. Argentina strode onto the renewables scene this year as the new government of President Mauricio Macri made good on promises set out in the RenovAr program, with 600 megawatts of solar expected to be contracted out this year. The government received offers totaling 925 megawatts of PV projects this month for the next auction, part of the so-called Round 1.5 that was designed to give a second chance to companies that did not secure contracts in Round 1. Solar prices in the first round averaged $59 per megawatt-hour. Contracts are scheduled to be awarded on November 25. Argentina has set a goal of 20 percent clean energy by 2025, and is seeing the region’s fastest growth in electric power demand. But projects have yet to break ground and caution remains the keyword for Argentina, Parikh said. “It’s an incremental process, and it would be foolish to assume that there will be strong solar development annually,” he said. “Development banks and investors are looking at how the country is turning things around. A lot of positive gains have been made in the transmission infrastructure, but there are still remote areas, and Argentina still has a lot of work to do to upgrade and invest in electricity infrastructure. How they get that buildout off the ground concurrently with the contracted PV projects will be very important. It’s an early-stage market, but a lot of the pieces of the puzzle are there, there have been some great policy initiatives over the last year, and it’s definitely going to be one of the most exciting places to watch over the next few years, along with Mexico,” he said. Brazil’s outlook is weak as demand has fallen year-on-year, with a 20 percent drop in the PV pipeline over the past quarter, Parikh said. Brazil is planning to hold its next clean energy auction in December, having canceled a previous tender in August. It will add just 263 megawatts this year, well below expectations, but the report predicts 189 percent growth for 2017 as contracted projects from the 2015 auctions come on-line. Financing remains a huge obstacle to PV development, with the country’s credit rating having taken a hit, hurting foreign investment, and development banks remain the primary source of financing. Local development bank BNDES has increased its support for PV projects, providing up to 80 percent of investment. Central America’s main challenge is transmission, where solar projects along the length of the isthmus need interconnection points. High amounts of solar added to the grid could overload some areas, and how those countries are able to balance new generation sources such as PV will be key. El Salvador made the most headway in solar this year, with the 101-megawatt Providencia plant breaking ground and 76 megawatts awarded in auction. The country will also boast Central America’s second-largest PV plant, to be built by French developer Neoen. Central America’s largest plant is the 144-megawatt Nacaome facility in Honduras. And in the Caribbean, Cuba is seen as dominating PV growth over the coming years, bring installed capacity to as much as 600 megawatts by 2021 from the current 25 megawatts. The island aims to increase its renewables share to 24 percent by 2030, up from the current 4 percent. Cuba plans to build 73 PV facilities in five provinces by 2030, according to official newspaper Granma. U.K.-based Hive Energy is building a 50-megawatt PV project in Mariel, which will be Cuba’s first utility-scale project, slated for 2018 completion. Work began in September on the 2.2-megawatt El Pino PV park in Cienfuegos, a province that aims to install 50 megawatts of PV capacity by 2030. Download the Latin America PV Playbook executive summary here. Carbon Pricing in PJM: Are State Policies at Risk?